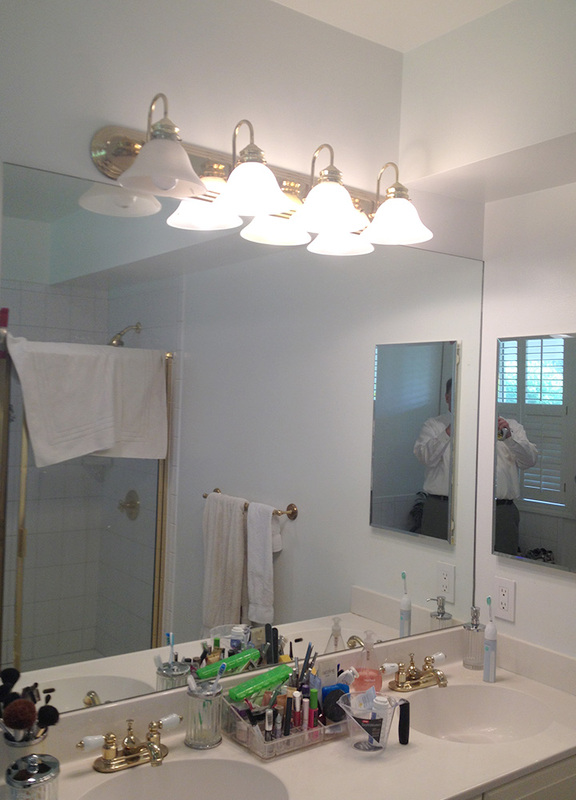 The project was to remodel an 80’s style master bath in their home that was converted from a barn to a residential house. 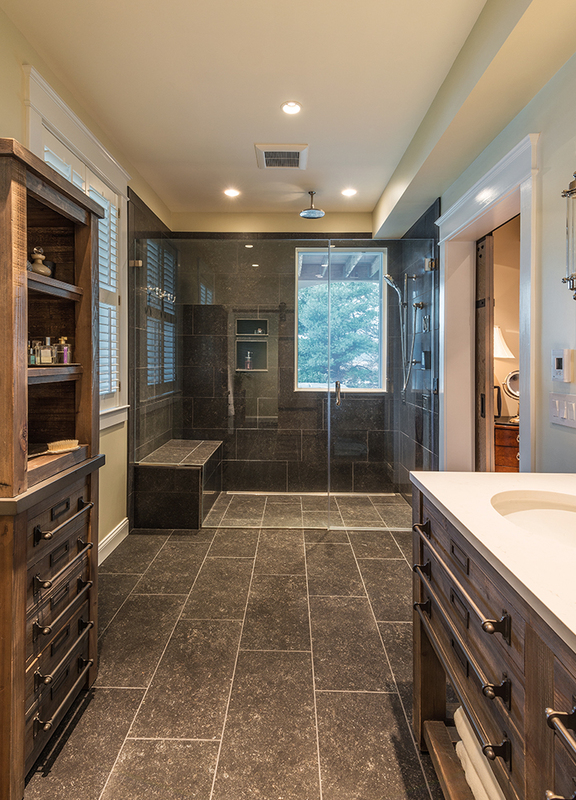 The existing bathroom style was not in keeping with the rustic charm of a barn. The clients were looking to incorporate a rustic modern feel with the latest technology to enjoy the space and make the space more accessible as they age in the home. The clients had a well thought out vision and were looking for a design build company to partner with to help them bring their concepts to reality. The clients presented photos of design ideas that they liked and described features of bathrooms from their travels. A digitally controlled showering system with a rain head and handheld faucet was important to them as well as body sprays and plenty of hot water. 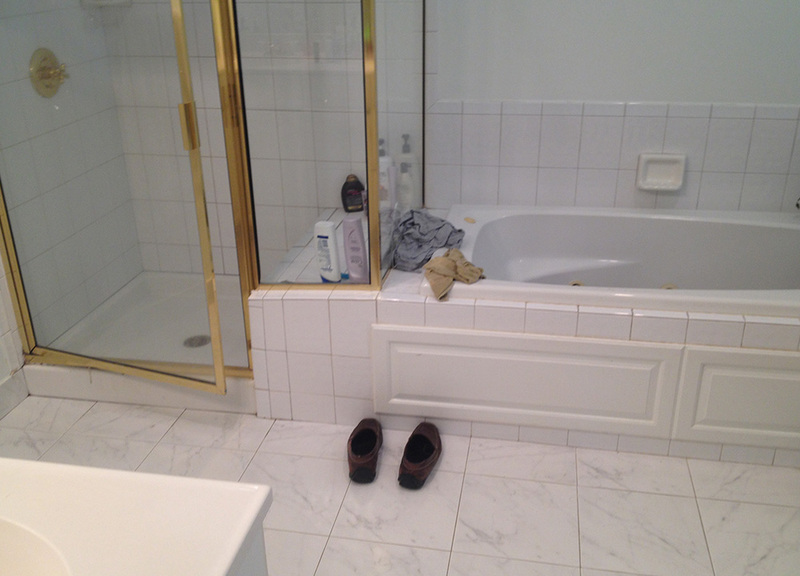 Another issue was a large window that would remain in the bathroom that presented privacy challenges. Since the existing house was a converted barn, they wanted to incorporate some finishes to incorporate that feel in the space. They also loved the look of natural blue stone but were worried about the maintenance issues with a natural stone. Several challenges with the structure had to be overcome. One challenge was the removal of a load bearing wall. Since the original structure was a barn, engineering was required along with a new steel beam and concrete footer was needed to support the load. Another challenge was the large window that was located within the space for the new custom shower. Privacy and safety were the major concerns. Working with the client, we were able to find a company that created an electronic privacy film that could be applied to a tempered glass window. When attached to the window and powered, the film created an opaque finish that allowed for privacy while showering. When the switch was turned off, the film would become clear allowing unobstructed visibility. A third challenge was supply enough hot water to the shower system and to maintain hot water in the other rooms of the house. To supply enough hot water, two electric hot water heaters were installed in series to provide hot water to all of the house and meet the variable demand. The plan was to remove the existing bathroom and to incorporate that space and the area of an existing sitting room to create a larger bathroom. The new bathroom included a large custom barrier free shower with bench seat, digitally controlled shower system with body sprays, rain head and hand-held shower. Porcelain tile that was a perfect match for blue stone would cover the floor and shower walls to provide the desired look with the issues found with natural stone. 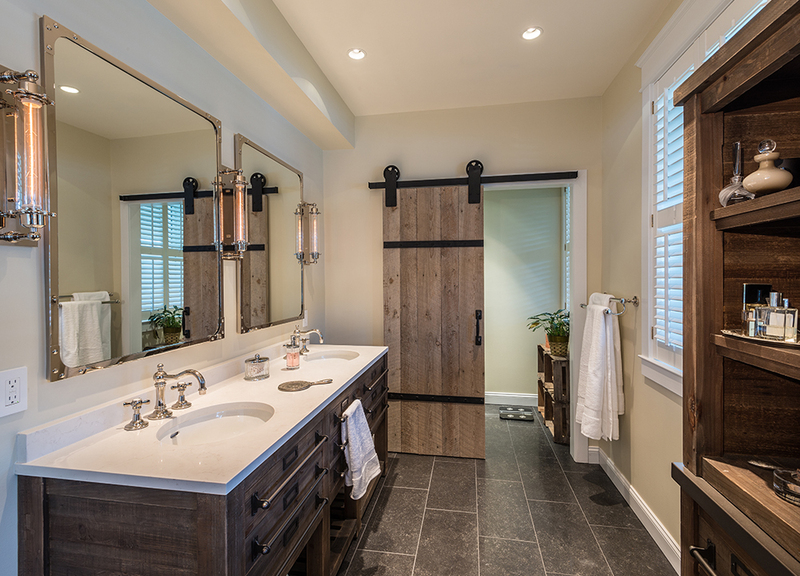 A private water closet was created for the toilet and rustic barn doors made from reclaimed lumber were designed to enter the bathroom and water closet space. The new steel beam was wrapped with reclaimed barn board as well to continue the rustic theme. Free standing vanities that included the barn feel were designed along with manmade quartz countertops that simulated marble without the maintenance issues. Hardwood flooring sourced from reclaimed barn wood was installed in adjacent bedroom to continue the rustic feel. When the project was completed, it married the rustic charm of a converted barn with the modern features and function of an updated bathroom. The clients loved the look of barn wood details and the shower and I enjoyed the challenge of creating the electronically controlled window to maintain privacy and light. Restoration Hardware Vintage Cross-Handle with Polished Nickel Finish. Artisan Hardware Aspen reclaimed barnwood door with Vintage Strap hardware.